[CONT](VC/RC):If the number of your other rear-guards with “Chouchou” in its card name is one or less, this unit cannot attack. [AUTO](RC)[1/Turn]:[Counter Blast (1)] When your other rear-guard is put into your deck, you may pay the cost. If you do, reveal five cards from the top of your deck, and if all of those cards have “Chouchou” in their card names, call up to one card from among them to (RC). Shuffle your deck. Continuing in the vein of 10k beaters with abilities, we have this. The first condition may as well not exist assuming your starter hasn’t been sniped or anything. So examining the second ability. Once per turn, it makes up for any -1s incurred from your various skills (not including the returned unit anyway), but the advantage gained is random, so that’s less good, and it’s only good once, so there’s not much room to spam Chouchou bounce even with this. Not terrible and the bulk alone probably makes her worth running, but hardly something to rely on heavily. What’s up, Rogue Squad?! It looks like we’re taking another trip on the Chouchou train, and this time, it’s the new Grade 2, Darina. 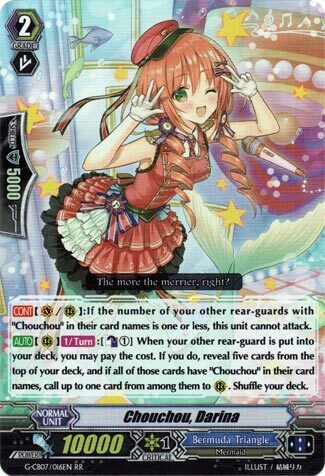 What I like about this is that it covers a big drawback that the Chouchous have, and that’s their lack of field presence after they have a big offense turn (they’re like Spike Brothers…except as mermaids instead of football players), but Darina lets you call another unit so long as your deck is a pure Chouchou deck (and let’s face it, it might as well be considering how restrictive they are). The only thing hurting this card is if you can’t make a field to begin with and can’t fulfill her restriction on not able to attack if there aren’t two or more other Chouchous. It hurts if this is all you have and have little to no ways to make a field during the Battle Phase. Aside from that, this isn’t too bad for the Chouhou. Next Time: The original idol of Bermuda Triangle.